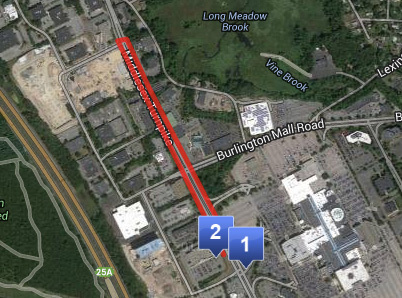 In the Boston suburb of Burlington, Massachusetts, the AMC movie theater is right across the street from the Burlington Mall. But if you’re planning to travel between these two destinations on foot, you’re in for quite a hike. The closest crosswalk is more than half a mile down the Middlesex Turnpike. That means crossing the road — if you’re going to do it “the safe way” — requires a 1.2-mile journey, and it’s definitely not going to be a pleasant one. Local resident David Chase reports that only one side of the street has a sidewalk. Sadly, this situation isn’t even all that unusual in the United States. In most American cities you can find streets that turn what should be short, easy walking trips into excursions so long and humiliating that you might as well drive. Or, if you don’t have that option, you can take your chances playing a high-stakes game of Frogger. Streetsblog asked our readers to help us find America’s “Least Crossable Street” by sending in examples of these monster roads. You responded, and hopefully a little public shaming will do some good. Check out the contenders and place your votes below. 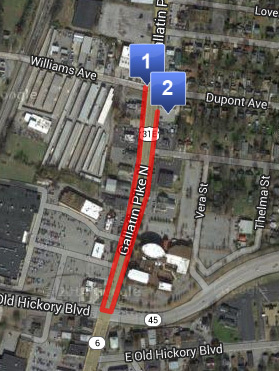 Reader Patrick Arena singled out Gallatin Pike as a daunting obstacle for people on foot. Walking across the street legally from the bus stop at Gallatin Pike and Williams Avenue would take you half a mile out of your way. The nearest crosswalk is roughly a quarter mile south at Old Hickory Boulevard. Worse, Arena added, Gallatin carries “two of the Metro bus lines with the highest ridership,” so the local transit system drops off riders where they have to contend with this deathtrap of a street. 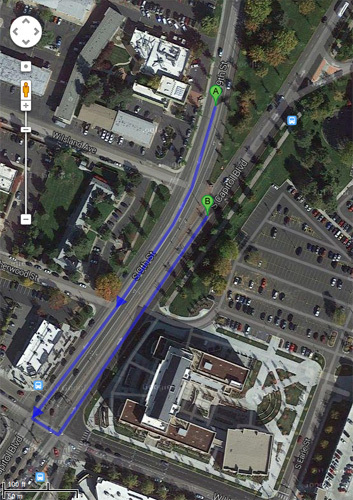 Getting from one side of Boise’s Capitol Boulevard to the other will take you about six minutes on foot, a distance of roughly a third of a mile. The worst part is, halfway through this walk, you have to cross a total of 20 lanes of traffic to get to the other side of Capitol Boulevard, because one leg of the intersection lacks a crosswalk. Yeesh. 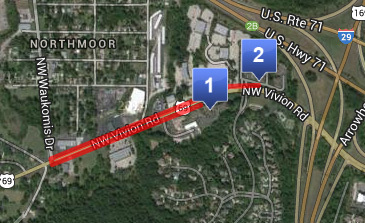 There’s an apartment complex that straddles NW Vivion Road in Kansas City, Missouri. But as reader Kevin Carlyle points out, walking from the apartments on one side of the streets to the office or to resident amenities like a pool involves a one-mile trip to Waukomis Drive and back. In Phoenix, writes Lisa Parks, half-mile superblocks are the norm, making it generally dreadful for walking. She says the worst street to cross could be West Indian School Road, where getting from the Phoenix Christian Elementary School just down the road to the Arizona Chapter of the National Safety Council would require a half-mile detour to the crosswalk at North 15th Avenue. This is Big Beaver Road in Troy, Michigan. Robert Wright stayed in a hotel here a few weeks ago and had a hell of a time reaching the restaurant across the street. Above, we measured how far you would have to travel on foot to get from LA Fitness to Big Beaver Tavern on the other side of the road. Were you to use the nearest crosswalk at Rochester, you’d have to travel more than a half mile. Atlanta is known for uncrossable streets, and here’s a good example. If you want to cross Pleasantdale Road from the bus stop at Pleasant Shade Drive to reach the apartment complex across the street, you have to travel three-quarters of a mile out of your way. Submitter Jacob Mason said this area was much like the setting where an intoxicated driver ran over and killed the 4-year-old son of Raquel Nelson in 2011. Nelson was charged with vehicular homicide for “jaywalking” from the bus stop to her apartment, rather than walking one-third of a mile to the nearest crosswalk. Mason said Pleasantdale Road is lined with apartment complexes oriented toward low-income residents, many of whom lack cars. “It’s really dangerous, and I’m sure people have been killed here,” he said. Vote below to help us determine which road deserves to be called the Least Crossable Street in America. Which is the least crossable street? Jacob here. The Atlanta example is actually far worse. There are bus stops and a park across the street from a bunch of apartment complexes (not sure how the location got changed, and the road is Pleasantdale Road, not parkway). 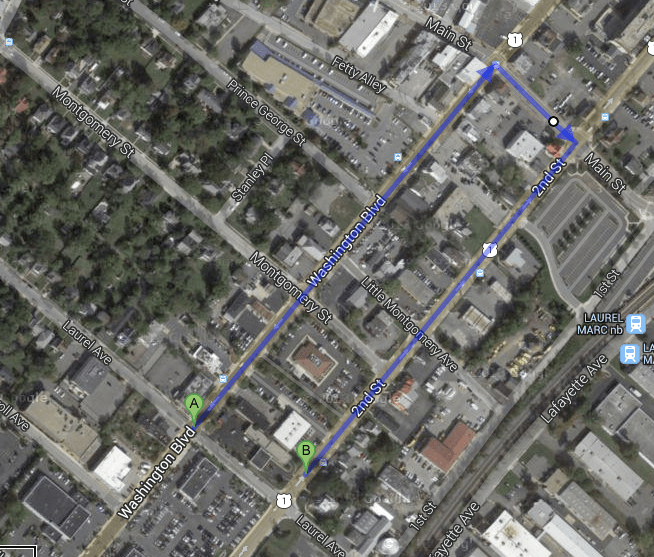 To get there with a crosswalk, you need to travel at least 1.5 miles. At some places it’s closer to 1.6 or 1.7 miles. Oh yeah, and the street is 45mph with 4 travel lanes and a median turn lane. This is what passes for safe pedestrian crossing in this part of metro Atlanta. Basically, we tell kids “run for it”. That link doesn’t direct other people to a precise location so we did the best we could. Angie, you should realize by now that MoDOT has expanded highways so dramatically that even once walkable neighborhoods are no longer pleasant are walkable. Numerous stores, restaurants, etc that are just 500 feet away now require walking 1.5 miles one way since pedestrian bridges have been removed in building the New 64 expansion. Solutions exist but MoDOT has little interest in serving pedestrians or cyclists. This one is pretty bad. The only way to cross the street on the rail trail? Walk .5 miles round trip to the light. You would think if you are going to have a trail you wouldn’t make people walk along a car choked road for half a mile to cross the street. I think you’re just supposed to catch a train to get across that street. Maybe we need to restart the contest (I’m the Burlington entry). They’re right about the Burlington one. That entire area is totally impassable without a car, and it isn’t even pleasant with one. Even adjacent stores have absurd driveway designs to get to segregated lots. Walking from one store to another is a mess, and the mall’s parking lot involves a number of bad turns to get around the building. The ‘seven-mile stunner’ from New Jersey seems to be a google maps snafu. It’s closer to 1.5 miles, with sections such as this. Evidently, the route is well used. Downtown New Brunswick is pretty walkable but go a mile in any direction and good lord it’s terrible. Yeah. I still think the horrors of trying to cross US 1 (NOT an expressway) in New Jersey near New Brunswick are worse than anything in the nomination list here. I discussed this on the previous entry. It practically doesn’t matter where you try to cross it, you’re half a mile away from the nearest crosswalk at best. It’s just as bad in a car! The problem is, this is *typical* of the entire length of US 1. Put in walking directions, and Google tells you it’s impossible. Google is correct. The next crosswalk north is at Avenel Rd. Heading south on the south side, there IS NO next crosswalk; it’s completely cut off by US1, US9, and the railroad. And please note again the driveways here. US 1 is a local access road, not an expressway. US 1 needs a road diet. I’m voting for US 1 in New Brunswick, NJ because it’s worse than all of these. It should be in the competition. It was disqualified due to a mistake on the part of the Streetsblog Moderator, who thought it was an expressway. It isn’t, it’s a local access road full of driveways. That confusion shows how bad it is, doesn’t it? in burlington, there’s a crosswalk at mall road now. With it’s own beg again button in the middle of the street. Since when? I guess they were repaving it last week. Oddly enough, given the chance to bike to the office that’s not in Burlington, I take it, so I haven’t see it with my own eyes for about a week. None of the above. I pick Oregon 99W at almost any given point between Oregon 217 in Tigard and US 26 in downtown. 8 miles, 3 crosswalks, no sidewalks for most of it, 8 lanes across in places. CROSSWALK CLOSED signs appear more frequently than signs reminding you you’re on 99W or which direction you’re going (since it’s not hard to get turned around if you’re unfamiliar). I’d like to nominate rt 9 in the ma suburbs of natick & framingham. Like Burlington, there’s tons of shopping right along this roadway. good luck reaching a store on the other side on foot without having to walk miles to reach a crosswalk, then cross 6 lanes of traffic & a rusty fence that separates the 2 sides. Apparently the thought when constructing this disaster of suburban planning was that left turns are unsafe so they must be prevented at all costs. The cost at this point is the daily sanity of motorists and pedestrians as we endure this! the suspense is killing me – when will the voting be over so we can know the ‘winner’? T4A Building Album of USA’s Most Dangerous Streets — Send Your Photos! T4A Building Album of USA's Most Dangerous Streets, Needs Your Photos!